A girl Parasha Pitunova comes to Moscow from a deep province, eventually she arrives at a house. This is a story about the house and its inhabitants. 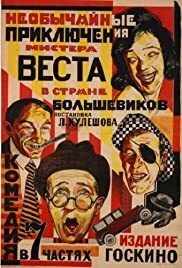 This film, about a series of adventures an american businessman suffers in Soviet Russia, is unusual for the soviet movies of the 1920s: it's a comedy, and it's very funny at that. It also shows a sympathetic view of americans that is rare in films from the Soviet Union.